The president of the Norwegian Parliament, already tied to a huge budget overrun, has now landed in more trouble for allegedly exceeding his powers and then withholding information. Olemic Thommessen of the Conservative Party denies any wrongdoing but now faces questions from the national assembly’s disciplinary committee. Thommessen has led the Parliament (Stortinget) since the Conservatives won the last national election in 2013, and his position makes him second in line as head of state behind the monarch. 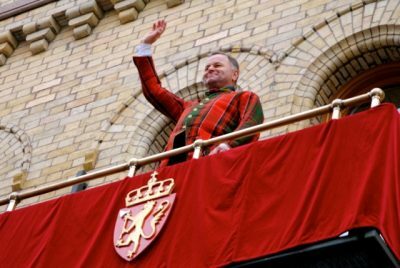 He recently has attracted strong criticism, though, over his involvement in a major parliamentary building project that’s costing nearly NOK 2 billion more than budgeted, and for taking sides in Norway’s heated debate over wolves, against his own Conservatives-led government. Now Thommessen is fending off even more serious charges. They stem from the Parliament’s decision to set up a commission (called the Solbakken-utvalget) to evaluate the work of another parliamentary commission that monitors Norway’s top secret intelligence, surveillance and security services (the EOS-utvalget, which stands for Etterretnings-, Overvåkings- and Sikkerhets- commission). It’s been 20 years wince the EOS commission was set up, and the Parliament wanted to assess its operations. Thommessen has been criticized for having asked members of the EOS commission to set aside their confidentiality oaths when questioned by the Solbakken commission, even though he had no right to do so under the law. Thommessen also allegedly tried to change the Solbakken commission’s mandate. EOS members objected: “We sit on some of the most sensitive information that can be found in Norway,” the EOS commission’s leader, Eldbjørg Løwer, told newspaper Dagsavisen, “and we manage it on behalf of the (intelligence) services.” Løwer, a former defense minister for the Liberal Party, said it wasn’t enough that the Parliament’s president simply freed them from their confidentiality oaths. “We wanted to be evaluated and were ready to give all the information we could,” she added, but only if it was legally revealed. Her committee thus sent a protest to the president’s office (Presidentskapet) on the matter, which Thommessen and/or his staff sat on for seven weeks before Members of Parliament (MPs) and the parliament’s control and disciplinary committee were alerted to it. The EOS members were eventually given legal dispensation to share sensitive information with the Solbakken commission, but only after their disagreement with Thommessen’s office came to light. Martin Kolberg, head of the disciplinary committee, confirmed to Norwegian media outlets late last week that his committee had sent a letter full of inquiries to Thommessen’s office about the matters. “We found there was reason to pose some questions,” Kolberg of the Labour Party told newspaper Aftenposten, but he wouldn’t characterize how serious he thinks the matter is, but the letter from his committee is 11 pages long. News bureau NTB gained access to the letter sent by the Parliament’s disciplinary committee to Thommessen’s office, and reported that it also maintained that the president and his office “cannot … without consent from Parliament for dispensation from its own rules,” hold back the written objections from the EOS commission. Nor were the EOS’ objections archived properly, according to Kolberg’s committee. Now Thommessen must respond in writing to the disciplinary committee’s questions. How he answers can determine his fate, according to committee members, but meanwhile Thommessen has flatly denied any wrongdoing. “I can’t be absolutely certain that everything we have done is completely perfect,” Thommessen told Aftenposten himself in an interview over the weekend. “but I will determinedly deny that we have withheld documents from the Parliament or broken the rules for how the Parliament does business.” Other members of his office, who include MPs from various political parties represented in Parliament, share Thommessen’s view. Thommessen is also accused of trying to alter the Solbakken commission’s mandate from Parliament, by writing to it as early as 2014 that the commission shouldn’t evaluate how to secure “Norwegian democratic control of foreign states’ surveillance of Norwegian citizens.” Thommessen claimed the Parliament hadn’t decided on that specific aspect. Surveillance of Norwegians carried out by the US Embassy several years ago became a major issue that angered many Norwegian politicians at the time. Thommessen claimed the entire matter was handled by his bipartisan office, not him personally. “This isn’t something I’ve done alone,” he told Aftenposten. A law professor at the University of Oslo has said that Thommessen himself should resign, though, if the criticism against him is upheld. “I don’t think it will be upheld,” responded a defiant Thommessen. His formal reply to the disciplinary committee’s questions is expected later this week, or next.